Together Mark Driscoll and Gerry Breshears have co-authored three books: Vintage Jesus, Vintage Church and Death by Love. These books address respectively the topics of Christology, Ecclesiology, and Soteriology at a popular level (quite creatively in the case of Death by Love), but Doctrine is their most ambitious work together and covers a far broader scope. It is an introduction to theology, and with 436 densely filled pages subtitled What Christians Should Believe, there is a lot of content to be found here. Doctrine aims to bring basic and central Christian doctrines down to an accessible level whilst remaining theologically robust. Rather than following closely the common categories found in systematic works (Prologomena, Bibliology, Theology Proper, etc) the authors instead chose to structure the content a little differently. Each chapter is focused on God, with titles such as Trinity: God is, or Incarnation: God Comes. At the end of the day, most of the chapters still resemble the traditional categories, but this unique format is welcome. The chapters progress in somewhat of a chronological pattern: beginning with God, then His self-revelation, His work of creation, His judgment in the fall, His promised redemption, and so forth. Rather than each section of theology being disconnected from the others, this approach helps the reader see how each doctrine plays a part in the narrative of redemption. Each chapter is broken down into smaller units that begin with a question. For example, ‘Why were some books not accepted as Scripture?’ or ‘Was Jesus fully Human?’ Each chapter also ends with practical questions, such as ‘What are the practical implications of the Trinity?‘ Forming the chapters this way keeps the reader’s interest and also ensures that common questions are being answered. However, this approach slightly hinders the book’s usefulness as a resource since it is less logically structured than a traditional systematic theology. However, the general index at the back might assist the reader find particular topics. As to the content itself, this book is densely packed and covers a lot of ground. In most chapters the majority of primary doctrinal issues are addressed clearly and concisely. The writing is mostly absent of ‘academese’, and is easier to read than Wayne Grudem’s popular and accessible Systematic Theology. Critics of Driscoll’s preaching style should not be turned off to this book; this is a serious work absent of jokes and short on stories. There is also a focus on practical application – our need to respond as Christians to the truth that we are being presented with. There are even chapters on worship/idolatry and stewardship. Both are important and practical issues that Scripture has much to say about, but not typically found in your Systematic Theology. These additions are welcome and practically useful. While this book is great on the whole and mostly achieves what it sets out to do, I do have a few criticisms. By subtitling this book What Christians Should Believe, we are left to decide if this means that a) the authors attempted to represent core doctrines that all Christians agree on, or b) the authors present their own views doctrines that they believe all Christians should adopt. Since there is no introduction or clear indication of the intended audience of the book, it’s hard to determine which alternative is correct, though I’m inclined to think they’re aiming for the former, since most of the time is spent on broad doctrinal issues, rather than focusing on unique theories. However, if that is the case, then there are a few exceptions. In the chapter on creation, while the authors present a variety of views they ultimately defend one called “Historic Creationism” (p89-90, indebted to John Sailhamer) as the best. However, this view is certainly not a common one among Christians, and unfortunately it is not explained in much depth. Secondly, when the authors discus the extent of the atonement (Limited Atonement vs Unlimited Atonement), they present a novel view known as Unlimited Limited Atonement (p269-270, see link below). It appears in these cases that the book aims to reflect what Driscoll & Breshears believe, rather than universal Christian doctrine. I don’t want my criticism to be too strong however, as in both of these areas alternative views are given a fair representation also and the authors have the right to present their own views. The merits of these views are not my concern, but the fact that they are minority positions in a general theology book and are not sufficiently defended because that would be outside the scope of this book’s purpose. Having just taught an Intro to Theology class at CCBCY, I know too well the danger and temptation of setting forth a doctrine and then giving a few proof texts as support. While this allows one to cover more topics, it doesn’t properly ground our doctrines in Scripture and unfortunately Doctrine falls into this same trap at times. This is not to say that Scripture is not quoted and exposited, but with the sheer amount of content in the body of the book, the footnotes (which contain the majority of the supportive texts) have been reduced to a tiny font size. This unfortunately implies the footnotes are far less important, and would be easily overlooked. Rather than teaching Biblical truths and that there are verses somewhere that support them, we teachers ought strive to show students that Christian theology results (or ought to) from a careful reading of Scripture. The chapter on the resurrection was quite disappointing because the focus suddenly shifted from theological to primarily an apologetic one. The authors devoted the majority of the chapter to reasons why we can trust the resurrection as a historical fact. This is crucially important, but in a doctrine book it’s unfortunate that the wealth of theology related to Christ’s resurrection and the implications for Christians is somewhat neglected. 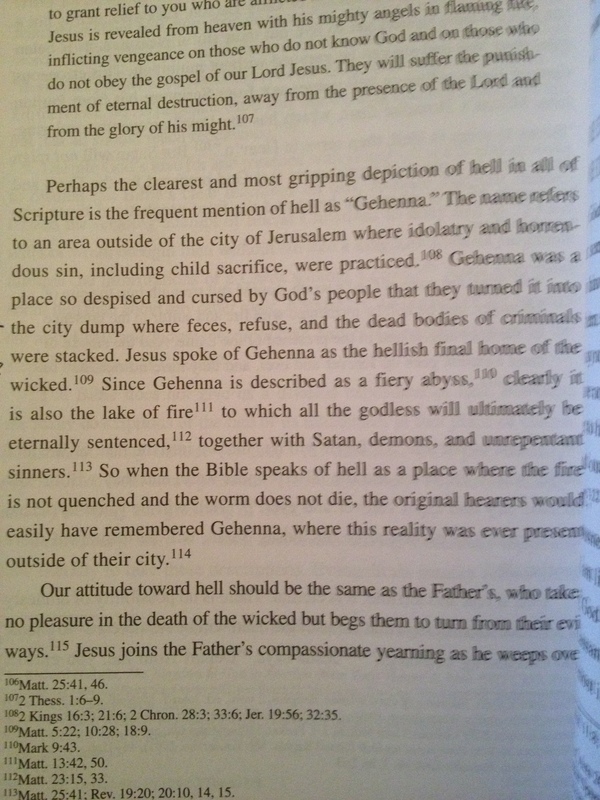 The treatment of hell was surprisingly weak. The majority of this presentation was on defending hell and God’s fairness. This is a noble aim since the justice of hell is constantly questioned, but the defence seemed more rhetorical and philosophical than Scriptural and puts the skeptic in the place of judging God’s righteousness. Unfortunately the emphasis was placed almost entirely on human concerns, rather than Scriptural teaching. For example, the authors state, “[i]n a very important sense God doesn’t send anyone to hell” (p427), and see God responding to our rejection of Him by simply allowing us to go the way we want: “Thy will be done” (p428, paraphrasing C. S. Lewis). This approach formed a significant basis of their defense, and while there is truth to this concept, there is so much more the Scripture has to say. The Word makes it plain that hell is not just about rejecting God and thereby getting what we chose; it is in fact a punishment for sinful behaviour (Col 3:5-6) and a destiny that God does actually righteously condemn sinners to (Rom 2:5; Matt 25:46; 2 Thess 1:9; Heb 10:29). The authors rightly state that God cannot be righteous and leave sin unaddressed, but the sins listed as example are all vertical – against other people (p429). 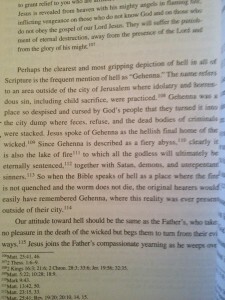 A robust doctrine of hell includes all the above, but the severity of sin and the righteousness of hell are watered down when not shown in relation to our holy creator God. The authors aren’t afraid of uncertainty in certain areas, and it was refreshing and humbling that they weren’t always dogmatic. For example, when addressing the question of the destiny of the unborn, after presenting some underlying convictions, the authors humbly state that a conclusion cannot be reached with certainty because Scripture is ultimately silent on this issue (p435). 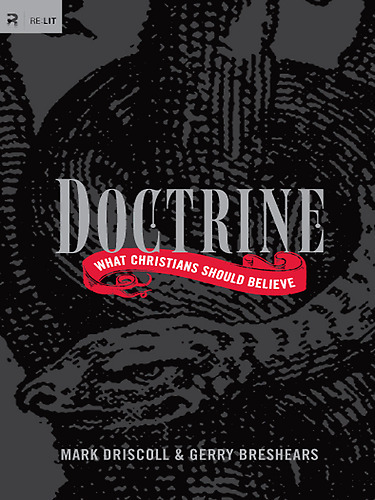 Doctrine would serve as a good introduction to theology for a young adults (or older) group. As noted above, the approach and language are refreshingly easy, and Driscoll’s name is a drawing point; some might pick up this book merely because he is the author. I have mentioned my concerns above, but overall this is a solid work and mostly achieves what it attempts to do. The book closes with an appeal for the unsaved to place their trust in Christ and and Christians to grow in maturity. It’s encouraging that this is more than an academic theology book, but the writers have a deep and visible concern for the reader’s salvation and spiritual health.